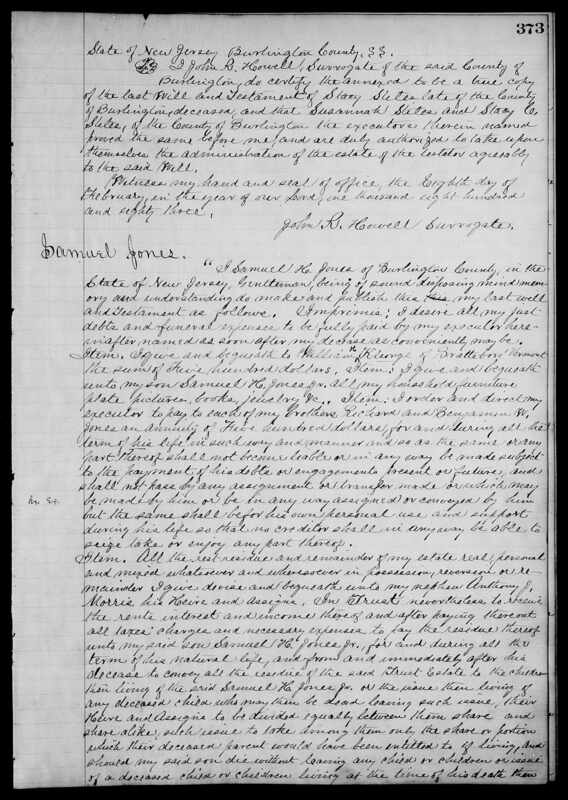 This week in #52ancestors will celebrate one of my few Kentucky connections: Samuel Howell Jones. Like his brother Richard Jones, Samuel was into a bit of everything but unlike Richard, he appears to have traveled extensively. Samuel Howell Jones was born on 30 June 1818 to Benjamin (1767-1849) and Mary Howell (1778-1836) Jones. He was the seventh of their eight children and although I have not been able to prove it, I believe he was born in Philadelphia because his birth is recorded in the Philadelphia Monthly Meeting minutes, along with the information that he was disowned in December 1850, likely due to marrying outside the faith. He spent a year at Haverford College from 1833 to 1834. Samuel married twice. He married Lydia H. Bishop (1828-1860) on 7 March 1849 but they had no children. They are enumerated in Philadelphia in the 1850 Census along with several of Samuel’s siblings: Mary B Jones Tobey and husband Samuel, Harriet Jones. Samuel is listed with the occupation of merchant. By 1860, the family has relocated to Burlington County, where Samuel and Lydia maintain a household that contains most of her family: Nathanial Bishop (cultivator of cranberries) and Harriet Bishop. Samuel’s occupation is “manufacturing” and his personal worth is $50,000. Then he married Eliza Catherine Jacob (1835-1864) on 1 May 1862. They had one child, a son named Samuel Howell Jones (1862-1894). Sadly, “Kate” died in 1864. I do not know what took him to Kentucky but I strongly suspect that it might have something to do with all the Louisville & Nashville Railroad stock in his estate accounts. Either Samuel was an investor or he was diversifying the family assets out of iron pipes to iron rails. A review of the family archive at the Historical Society of Pennsylvania will be necessary to complete this chapter. The next time I find Samuel is in 1870 where he and his son are living at the southern tip of Lake George in the town of Caldwell. Their next door neighbor is a Mary Bishop, who may be a sister-in-law. By 1880, the pair have returned to Philadelphia but are living in a hotel or boarding house. They both appear in the 1882 Philadelphia city directory as living at 1010 Spruce St. When Samuel Sr. dies in 1883, the pair have retired to St. Lucie, Florida due to Samuel’s poor health. A review of Samuel H. Jones’s Will and estate provides further enlightenment on the myriad things that Samuel was involved in and also gives some pause as to the family dynamics. 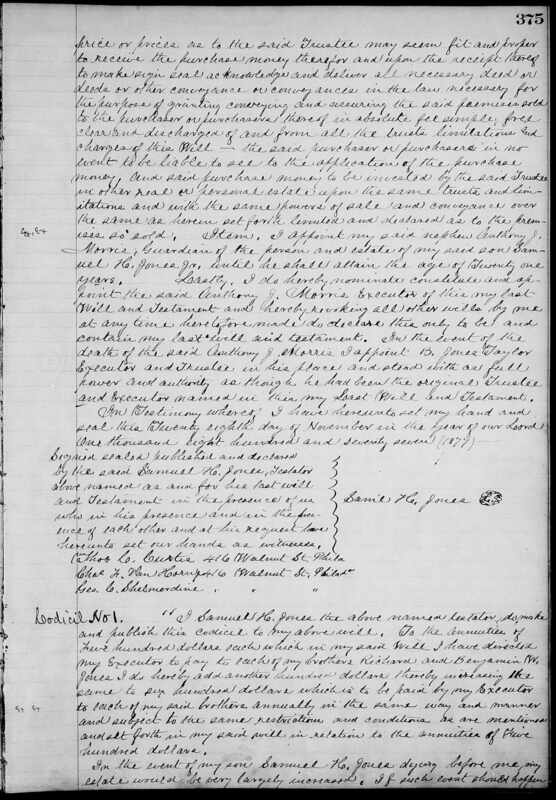 The will establishes right off an annuity to be paid to brothers Richard and Benjamin W. Jones. 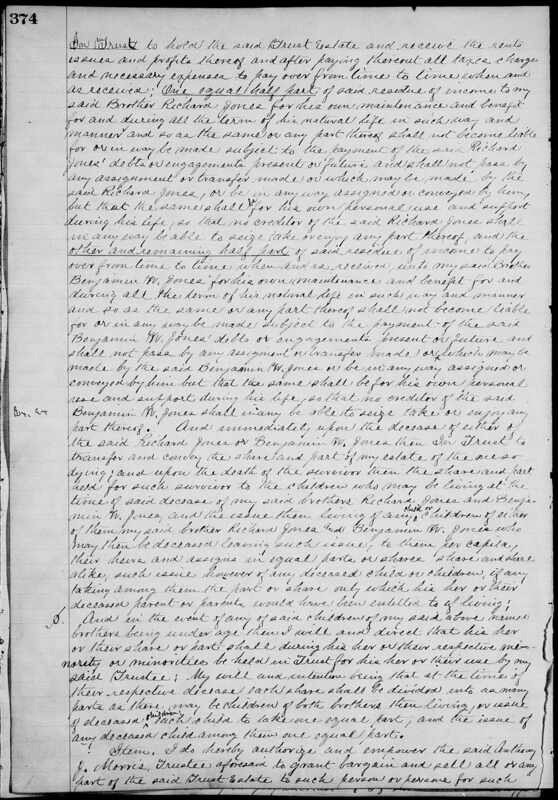 The rest of the estate, including the lovely description “remainder of my estate real, personal and mixed whatsoever and wheresoever in possession, reversion, or remainder” was put in a trust to benefit the children of his son Samuel H. Jones Jr. The person responsible for maintaining this trust was Anthony Jones Morris, Samuel’s nephew. There is a considerable amount of money and assets at stake here and I would imagine that Anthony J. Morris was busy juggling the demands of family for some time. However, in 1887 he appears to have petitioned the courts to request that the trust be administered by the Camden Trust Company. 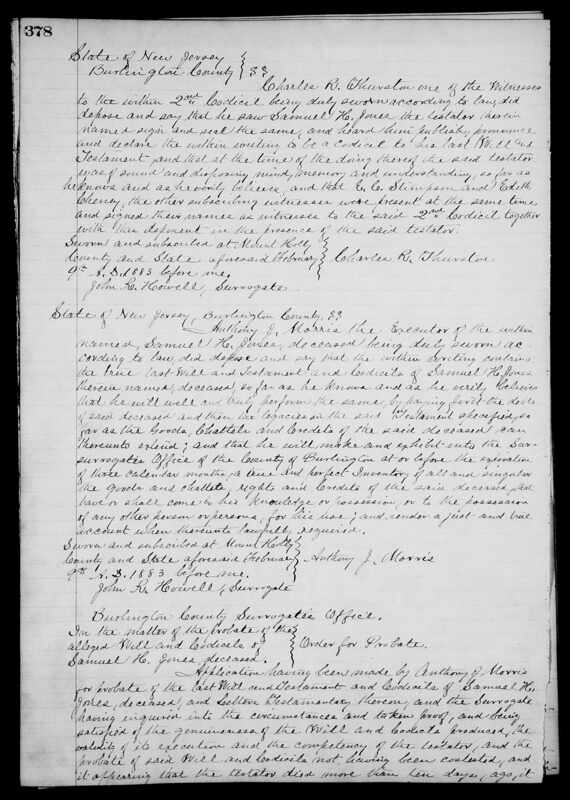 This week on #52ancestors I am writing about Mary “Stella May” Jones. She was the ninth child of Benjamin (1833-1896) and Mary Elizabeth Carrell (1840-1922) Jones, born on 22 June 1881. My great grandfather Arthur Wells Jones was her older brother. I am not sure exactly why or when she became “Stella May” but that is the name she went by most of her adult life. Stella Mae and Oscar lived most often in Freehold in Monmouth County but seem to have come back to Pemberton regularly. Oscar appears to have worked with his father as a monument maker but also is listed in various Census and military draft records as a clerk, railroad worker and as a motor delivery man for the Courier-News. They had a little girl in 1909 named Mae Ayres, who died shortly after birth and is buried in the Methodist Cemetery in Pemberton. They do not, however, appear to have been active in the Methodist Church. According to her obituary and other newspaper articles I found, Stella Mae does not appear to have been robustly healthy towards the end of her life. She may have suffered from complications from an appendectomy. Estella Mae Ayres died on 18 December 1946 at Seaside Park, NJ at the home of her nephew Arthur Rue after a stroke. She is buried in Mount Holly Cemetery. Names can evolve over a person’s lifetime. This can present a challenge when trying to determine if the record you are viewing is, in fact, the person you are researching. The trick, I think, is being open to the fact that your ancestor may have used different names in different contexts. My own mother could slide fluidly back and forth from Anne Tompkins Jones to Mrs. Barclay G. Jones to Annebo, depending on the circumstances. This week in #52ancestors I once again come up against that age old genealogical principal of looking for one record and finding not that record but another that solves a different mystery. I can track back to George Mortimer Prince (born Bradford Co. PA 1837, died Federalsburg, Md. 1909) with great assurance but the leap to George Washington Prince (1808-1888) is more difficult and further back is going to require feet on the ground in Massachusetts doing hard research. If I am correct in my conclusion that George Washington Prince is the father of George Mortimer, then Chandler Prince is an uncle. Confused much? Jonathan (1769-1831) and Patty Vinton (1770-1831) Prince had nine children, all born in Massachusetts, the first five in Oxford and the last four possibly in Sturbridge. The fourth child in birth order is Chandler Prince, born 14 June 1797 in Oxford, MA, and the eighth is my ancestor, George Washington Prince, born 17 July 1808 in Sturbridge. I find Chandler as the head of household with a family in the Census in 1830 in Orwell, Pennsylvania as well as in 1840 and 1850. From this I draw the conclusion that Chandler married Sally [possibly Lovette] prior to 1825, but I have not been able to find a marriage record yet. 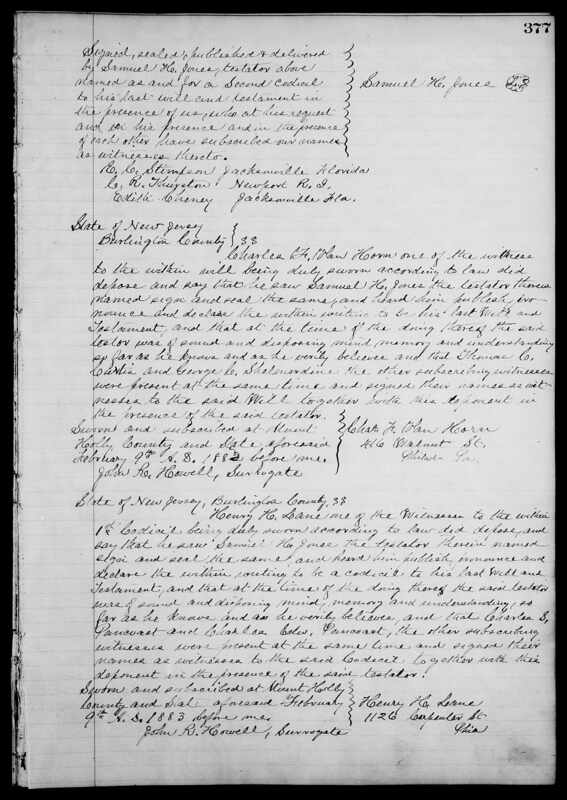 Chandler and family appear to have been involved in the Presbyterian Church, as on 14 January 1845, Chandler Prince puts up $5.00 toward the building of a Presbyterian church in Rome, Pennsylvania. The next time I find mention of Chandler is in the burial inscriptions from the Orwell Valley Cemetery, Bradford County, Pennsylvania: Chandler H. Prince, died 9 Feb 1852, aged 55 years. 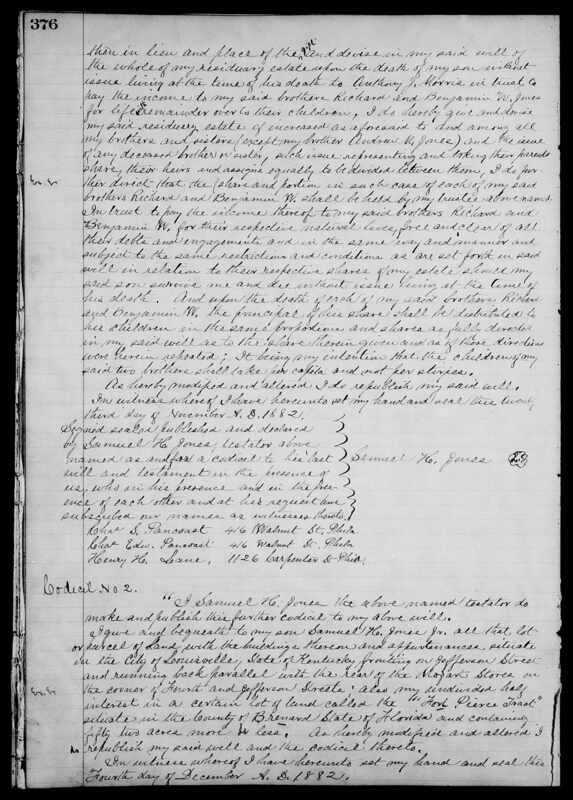 No will or estate is listed in the index to Registers for Chandler Prince but I did discover that the Index to Register’s Docket is up online through FamilySearch. And there, nestled between Chester and Ermina Prince is none other than George W. Prince’s will. Now I am off to write the Bradford Clerk of Courts for a copy of that will, which appears to have been executed by none other that George M. Prince.